The Predictive Models app and the Predictive Scenarios app (PAi applications) require OData services configuration on the frontend (UI) and the backend systems. Note: Let’s assume in this case, that the backend and frontend servers are on different machines. For the Predictive Scenarios app, the ANA_PAI_PF_SRV service is used in conjunction with Predictive Factory and SAP Analytics Cloud Smart Predict to create the draft predictive scenarios. The ANA_PAI_PS_SRV service is used by the Fiori app to display or update draft predictive scenarios. Also, the ANA_PAI_REPOSITORY_SRV is also needed. Enter the transaction /IWFND/MAINT_SERVICE in the top left side of the user interface. Select the System Alias field. Select the icon to open the SAP System Alias window. In the SAP System Alias window, select Local. Select the OK button to confirm the selection. In the External Service Name field, search for ANA_PAI_PS_SRV, ANA_PAI_PF_SRV and ANA_PAI_REPOSITORY_SRV. The results are shown in the Select Backend Services panel in the column Technical Service Name. Select the service names in the listing. The Add Service window opens. In Add Service window, for Package Assignment, select Local Object, or assign a suitable package as required. Select the icon to accept. The Information window opens, confirming that the service was created. For each service, select it and click the SAP Gateway Client button. 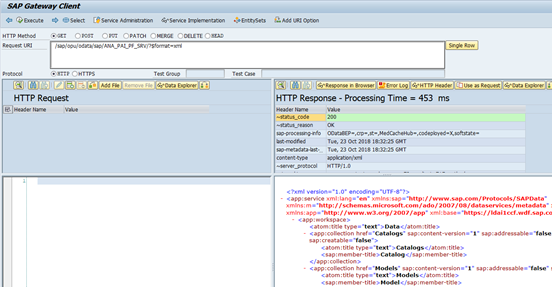 Click Execute (F8) and ensure the request works successfully e.g. The following steps are similar to the previous steps, but are to be executed on the frontend (UI) system. Note: The front-end system communicates with the backend server using RFC (Remote Function Call). Select the System Alias field and Click the Search button. Select the appropriate server name (backend) and double-click it. Select the Add Selected Services button. The Add Service window appears. Select Local Object or any suitable package that you may use. Select the green accept button. You may get an information pop up window confirming the service was created. Select the green accept button. The System Aliases section of the “Active and Maintain Services” screen should be populated with the front end system. Check out our next blog post for more details on further configuration and setup steps. In the meantime, why not refer to our official documentation on the SAP Help Portal at https://help.sap.com. Simply search for S/4 HANA, and within the Product Documentation area, select the Installation Guide. The chapter called “Follow-Up Activities for Predictive Analytics integrator” brings you through the business roles needed to access the tiles for the Predictive Models and Predictive Scenarios apps, setting up the OData Service and setting up the bgRFC Queue. Now you have completed the installation of PAi at both the HANA and Netweaver level. Stay tuned for next week’s installment where we will start to use Predictive Scenario available with S/4HANA out of the box.